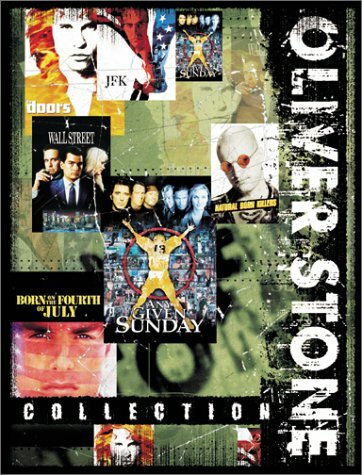 While this monumental retrospective of Oliver Stone's directorial career doesn't include Salvador or Platoon--Stone's early, acknowledged masterpieces of history and remembrance--it certainly sheds some light on the more controversial arc of his work ever since. Beginning with 1987's Wall Street, Stone's barbed tragedy about corporate raiders and blinding greed during the Reagan years, this cinematic six-pack represents a curious odyssey of generational touchstones, outright obsessions, and feverish experimentation. 1994's Natural Born Killers, for instance, is an explosive critique of inflamed media in a society of hapless onlookers. A wildly ambitious farce about two lovers who defy TV-manufactured perceptions by becoming notorious murderers, Killers pushes the limits of screen violence, visual literacy, and the mixed-media technique (juggling film stocks, incorporating video, etc.) that Stone introduced in JFK. If the result is somewhat cold and forced, it's also brazen. Most significant is the way this collection underscores Stone's drive to fuse historical drama with lingering emotions about the past. Stone, a Vietnam War vet, revisits that haunting debacle here in the masterful Born on the Fourth of July. Yet some of his most famous efforts still draw heaps of scorn for narrative hubris and factual recklessness. (Does anyone really believe John F. Kennedy was assassinated during a Lyndon Johnson coup d'état?) But time, as this collection proves, is on Stone's side. Eventually, JFK and The Doors will be seen not as a failed objective history, but as the experience of a tumultuous era in the imagination of a man who lived through it all and can't shake it off. By Lions Gate Home Ent.